House and Senate versions of the Farm Bill proposes cuts to certain programs and amendments to areas with a program. Among them, the largest conservation programs, CSP and EQIP programs are critical to conservation activity within the nation. 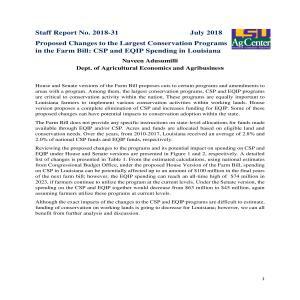 These programs are equally important to Louisiana farmers to implement various conservation activities within working lands. House version proposes a complete elimination of CSP and increases funding for EQIP. Some of these proposed changes can have potential impacts to conservation adoption within the state. A side by side comparison of the senate and house versions of the 2018 Farm Bill can be found in the attached file.